My poor old sawmill has been neglected this summer. I cut a lot of spruce this spring from the trees that succumed to the bark beetle infestation, and then put the thing away for other projects. When I tried to use it this week to get some cedar cut for the Estivant Pines project, it started but the head wouldn’t go up or down. I worked on it over the course of several days until I tried something that worked. 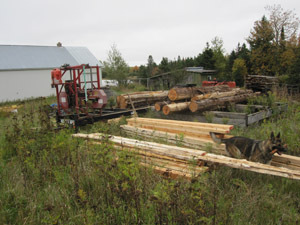 Once I got it going, I spent part of 3 days getting this pile of lumber made. I still have some to go. When I have all the lumber I plan to use for the three boardwalk projects in the pines, I’ll have sawed about 1,000 board feet. 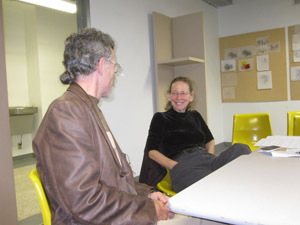 Yesterday was my long anticipated meeting with Wendy Brawler, founder and director of the GreenMap (greenmap.org.) I was lucky enough to be invited to a small gathering of students, faculty, and community members that met with Wendy and had a far ranging discussion about all things sustainable. Sitting across the table from her, I was reminded of some advice I gave Steve when he want away to college: “Spend as much time as you can with exceptional people.” Wendy surely fit the bill. I thought about things in new and different ways thanks to the energy she sparked around the room. 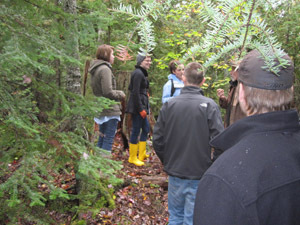 Following the round-table discussion, we assembled outside and departed for a field trip to the Estivant Pines. The organizer of Wendy’s visit to Finlanda, Rick Loduha, wanted her to see the pines, and wanted his students to see the site for one of their sustainable design projects: a possible “caretaker’s cabin” for the pines. We hiked around potential sites for the cabin, and then back to the pines for a short orientation talk. Some of us had to head back to Hancock, while some stayed and continued hiking the pines. I was one of those that departed early. Unfortunately for me, a headache had been brewing all day, and really started to take hold when I got back. I stopped and picked up a few things and then headed home to a dose of Maxalt, a bath, and a restful evening. By this morning, I was back to normal. 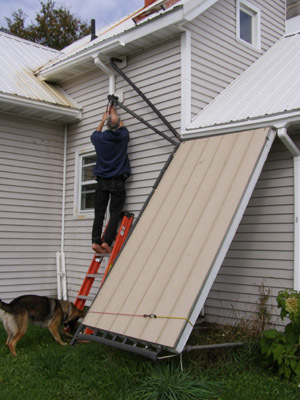 My first project today was completion of the dismanteling of the solar collector for this year. I had drained it a few days ago. I still had to remove the connecting pipes and cover the exposed unions with plastic to keep the critters out. It was warm enough to do this job without shoes! Then it was up the ladders and onto the roofs to clean our 4 chimneys. The 3 on the house I clean from roof ladders. 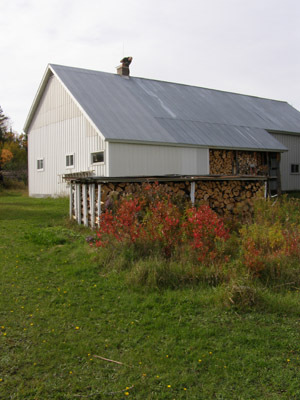 The garage chimney is cleaned by parking the dozer next to the building, setting the ladder in the bucket, and raising the bucket up to the roofline. Then I extend the ladder so I can reach the chimney. All the paraphernalia I was standing on is on the other side of the building, so it looks like I just got dropped by helicopter on the peak of the roof. The view from the roofs is always spectacular. I took several pictures but this was my favorite. 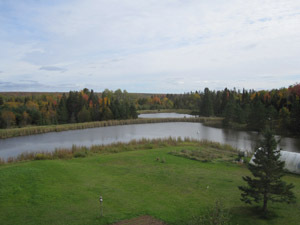 Our back pond isn’t really visible from the house until I get up on the roof, so I get a kick out of the different perspective I get whenever I get up on top. I was also struck by how much more obvious the mushroom “fairy circles are from up on the roof. After the chimney work was finished, I tackled the engines project. Along with the Scout and dozer I bought last summer, I got a bunch of parts, including the Scout 800 I sold the other day, and a couple of 8 cylinder Scout II engines. The engines were sitting outside and obviously deteriorating. I chained the first one up to the dozer and lifted it up. I then removed the transfer case from the end of the transmission, and set it aside in case I need one someday. Then I drained the fluids from the engine and drove it over to the pickup and set it in the bed. I did the same thing to the other engine. Monday morning when I drive in for my weekly errands, I plan to stop at one of the junkyards and see what I can get for them. I’ll be glad to have them off the property. 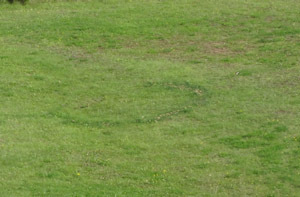 After my purchase last summer, the field was starting to look pretty junk-yardy itself. This entry was posted on Saturday, September 25th, 2010 at 10:27 pm and is filed under Uncategorized. You can follow any responses to this entry through the RSS 2.0 feed. You can leave a response, or trackback from your own site.